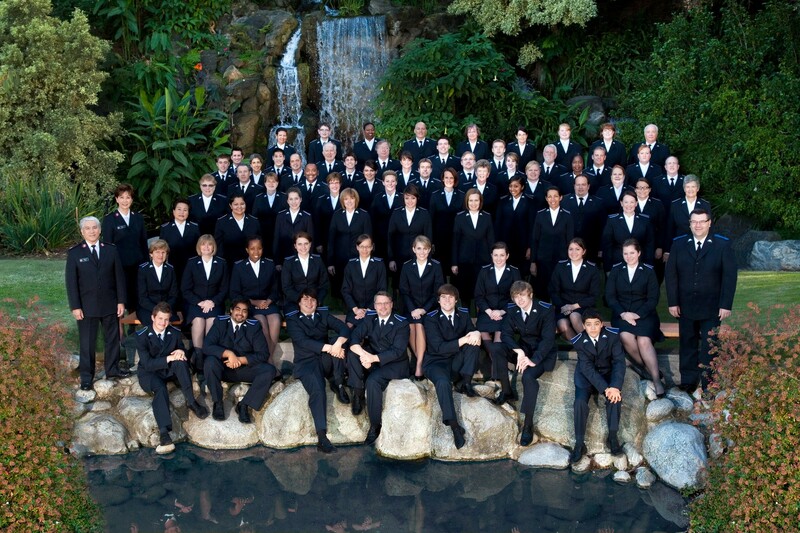 Have you ever been confronted by the reality of eternal truth in such a way that the experience is always remembered and can bring you to tears, even years later? 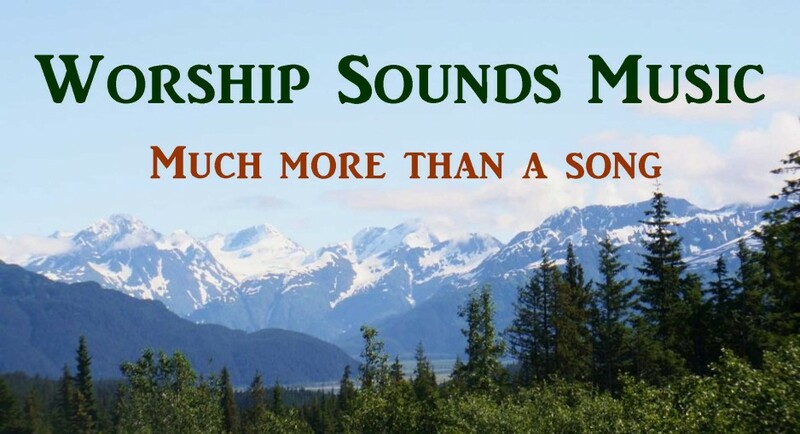 This post tells the story of such an occasion, when I was confronted with the reality of the resurrection (through “The Resurrection”) and the glory of my victorious risen Savior in an unexpected place. I will never forget what it was like to gaze up into the depiction of the face of my Savior. with the central figure of the victorious, risen Christ over 7 feet tall and displayed impressively upon a long, raised platform, flanked with the figures of the two cowering Roman guards on the ground. There was strength, life, vitality, and victory in the figure’s movement, love and benediction in His face, and a gesture of blessing through his raised hand. 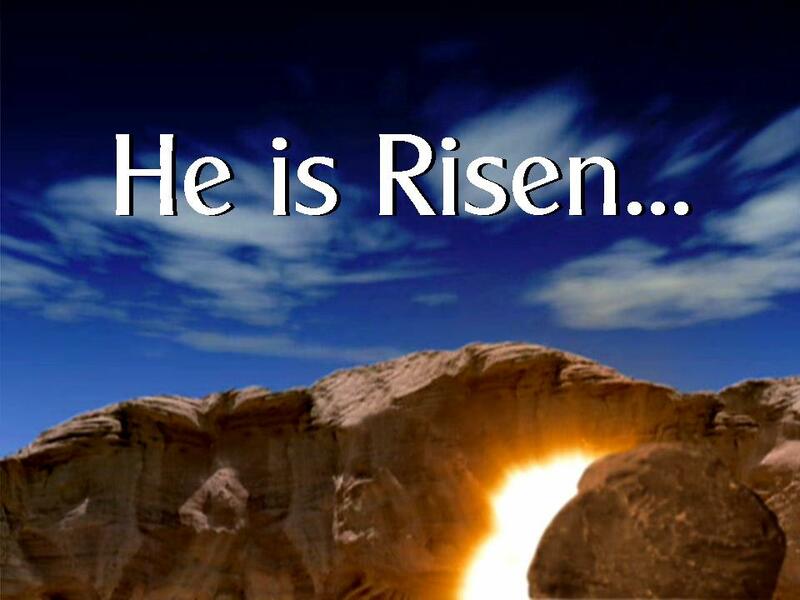 Hallelujah, He is risen! I Corinthians 15:54 is a victorious scripture for all Christians. Because of the resurrection of Christ, His victory over death, and God’s power over all that is, this verse tells us that “Death is swallowed up in victory!” (a reference to Isaiah 25:8 “He will swallow up death in victory, and the Lord God will wipe away tears from all faces…”) The source of our victory is our victorious Savior and Lord, Jesus Christ, and our all powerful God of love, who will demonstrate His compassion with the tender act of personally wiping away our tears. When this body that decays is changed into a body that cannot decay, and this mortal body is changed into a body that will live forever, then the teaching of Scripture will come true: “Death is turned into victory! When I visited the Louvre Museum in Paris a few years ago, one work of art struck me with the power of an image that has since been brought to my mind every time I think of our victorious Savior and His Resurrection. On the ground floor, in the Richelieu Sculpture Gallery, one enters a large doorway to a section of the gallery and is immediately confronted with a sculpture of the Risen Christ striding victoriously from the tomb, with the awe-struck Roman guards on the ground on either side of the central figure. Greater than life size at over 7 feet tall, the stature of the risen Christ is further magnified by the height of the pedestal on which all 3 figures are mounted. 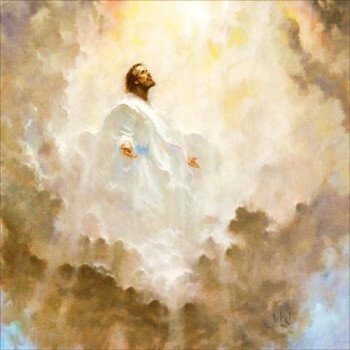 I could have stood and looked up at this depiction of my Lord for hours, with tears and emotion overwhelming me. For me, this image was so powerful and moving. It is impossible to adequately describe the experience of seeing this work of art in person. It was a visual representation of the very real power of God and His promise of eternal life in Christ. 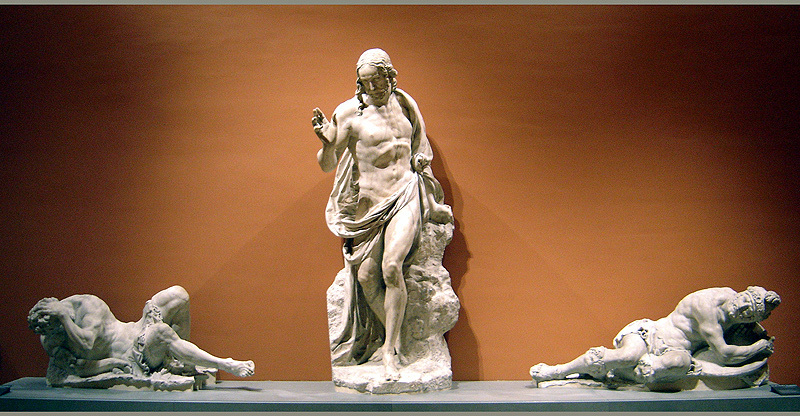 French sculptor Germain Pilon (1537 – 1590 ) created this 3 piece work in marble at around 1572. It had been commissioned by Catherine de Medicis, the widow of King Henry II of France. It was to be housed in a circular funerary chapel built on one side of the Basilica of Saint-Denis (the burial place of the kings of France). Construction of the Valois Rotunda began in about 1560, but the structure was never completed due to civil strife and lack of funds. 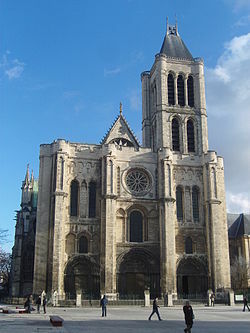 The Basilica still stands in a northern suburb of Paris (see photo), but the rotunda was destroyed in the early 18th century due to fears that the structure would collapse. As a result of the incomplete structure, Pilon’s powerful sculpture, called “La Resurrection,” never left the sculptor’s studio during his lifetime. For part of it’s history, the sculpture’s three figures were then separated and displayed in different locations. Now, on display in the Louvre at the gallery entrance, in front of a wall which provides a backdrop and sections off this sculpture from all the others in that particular gallery, the three figures have been reunited in a setting that allows the emotional and spiritual power of the sculptor’s original vision to be seen and experienced once again. Though I cannot help but marvel at the God-given talent that allowed the creation of “The Resurrection”, I can’t look upon this wonderful scene without thinking of our very real Savior and His love for mankind, His victory over death, and the salvation that is available to all in Him. Below, you will see a photo of “The Resurrection.” Though a picture can be powerful, there is no comparison to gazing up into the face of this depiction of the victorious Christ in person. And, as powerful as that experience can be, it will pale and be nothing in comparison to meeting our Lord and Savior face to face. Praise God! Death is swallowed up in victory! “Two Roman soldiers have fallen to the ground in awe at the sight of the resurrected Christ. With head bent at a slight angle and lowered gaze, this handsome, athletic-looking, muscular-legged Christ seems to be rising upwards into the skies. The group was commissioned by the queen Catherine de Médicis for the Valois Chapel that she was having built in the abbey of Saint-Denis, but it never left the sculptor’s studio during his life. To the reader, it may seem that too much focus is placed upon a work made by a man and not enough focus is placed upon the work of God in providing salvation through the life, death, and resurrection of Jesus. However, I think that it is fitting to recognize the works of men that do bring glory to God, which is our chief purpose for living. The very image provided by this sculpture and the impact that seeing it has made in my life is a reminder to me of God’s power and his provision for us. If I were a sculptor, I would want my hands to produce something that conveys the truth that death has been swallowed up in victory through the saving work of Christ on the cross and the power of our almighty God that raised him from the dead. I don’t happen to possess this particular talent, but all of us can bring glory to God just by doing what we do “as to the Lord and not unto men”, seeking to bring Him glory. 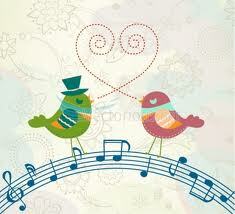 If you are a singer, sing of His glory and grace, His victory and might, His love and compassion. If you are a writer, write about it. Whatever you do, do it to bring glory to the One who gave his all so that we might know him, have victory over sin and hell and death, and live forever in Heaven with the Lord. None of the gospel accounts of the resurrection tell us exactly how Jesus left the tomb. The account that follows, from Matthew’s gospel, tells us that he was already gone when the stone was rolled away. Perhaps he did come striding right through the outer wall of that tomb, giving the guards the fright of their lives, as Pilon depicts in his sculpture. Perhaps he left through the tomb’s ceiling, bursting through the rocky hillside above. However he left that place of burial, I’m just glad he did! 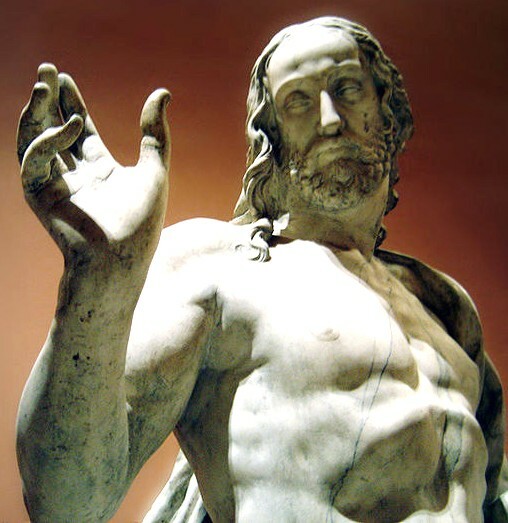 I like to think of the risen Christ much as he is depicted in the statue, fully alive!… strong and victorious! …confident in His purpose! … the compassionate and caring Lord of all creation, reaching out to all mankind in demonstration of the love, the amazing grace, and the power of God. 1After the Sabbath, at dawn on the first day of the week, Mary Magdalene and the other Mary went to look at the tomb. 2 There was a violent earthquake, for an angel of the Lord came down from heaven and, going to the tomb, rolled back the stone and sat on it. 3 His appearance was like lightning, and his clothes were white as snow. 4 The guards were so afraid of him that they shook and became like dead men.